Are you involved with a college or youth orchestra?? A conductor, player or administrator?? I’d love to hear from you, and I’d love to hear your orchestra play my music. Send me an email. Let’s talk. I am a product of the Youth Symphony system. I played for years (many moons ago) in the bass section of the Seattle Youth Symphony under Vilem Sokol. I also played in the World Youth Symphony at the National Music Camp in Interlochen, and in the University of Washington Symphony under Samuel Krachmalnick, to name just a few. Those were great years, fantastic years, some of the best of my life. I was absorbed in the wonders of the orchestra. And it was fun. Big fun. The younger generation of our art form is vital and alive. Multitudes of students sign up every year for the adventure of learning to play an orchestral instrument. Those musicians will always be able to cut their teeth on the music of Beethoven, Tchaikovsky, and the rest of the great masters, which is as it should be. But will they have contemporary repertoire that tweaks their imagination, challenges their skills and gets them fired up about the musical possibilities of the future?? My music isn’t written specifically for youth or college orchestras, but I feel like it’s well suited for that purpose. Not virtuosic in nature but absolutely challenging, based on contemporary styles, ideas and idioms. And fun. High school students in the greater Pittsburgh area were the judges that awarded CHORALE AND FIDDLE TUNE first place in the Pittsburgh Symphony’s 2014 Audience of the Future Composition Competition. 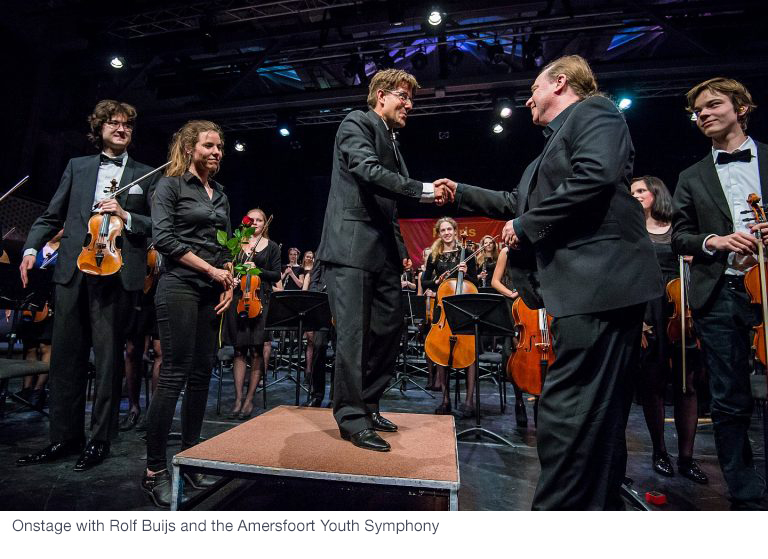 And the Amersfoort Youth Symphony under conductor Rolf Buijs did a fantastic job performing BY STEAM OR BY DREAM at the finals of the 2016 Keuris Composers Competition. The piece wound up winning second prize in the Youth Symphony division. Conducting the Amersfoort Youth Symphony at the final rehearsal for the Keuris Competition.